Portable restrooms and hand wash stations will make any event, work site, or location more comfortable for visitors to attend. Whether it’s weddings, birthday parties, reunions, hunting camps, golf tournaments, construction jobs, tailgating parties or sporting events, portable restrooms can keep things running smoothly and comfortably. And if you have workers on your site, portable restrooms can keep things running orderly and efficiently. We are open 24 hours a day, seven days a week. If you are looking for portable restrooms for rent, call us anytime at 602-714-2348. Portable restrooms are a great tool to increase productivity and meet the needs of crowds, guests and employees. Arwood Waste Pittsburgh, PA Division provides reliable and economical port-o-lets that your business can afford. They can be scaled to meet your needs and service levels can be adjusted. Need more restrooms on Friday than on Monday? Are more visitors waiting in line? Are workers leaving the jobsite or using facilities meant for guests? Arwood Waste has the solution to keep your site or location accommodating and comfortable. Hands-free, self-flushing porcelain urinals and toilets will make guests feel that they are in a clean facility. A mobile restroom trailer from Arwood Waste Pittsburgh, PA Division can include roof mounted air conditioning and heat, shatterproof mirrors, stainless steel sinks and solid-surface countertops that will provide guests with a quality, comfortable environment. 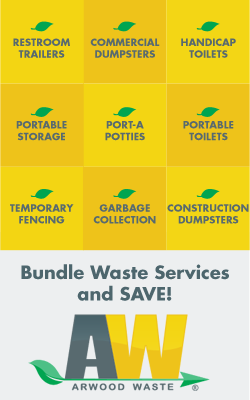 Call the experts at the Arwood Waste Pittsburgh, PA Division at 602-714-2348 or email [email protected] today for the best port a potty rental prices and more.